One of the most forgotten finals MVP ever. Most fans today have no clue who Jo Jo White is. Yet he was a key member of two Celtic championship teams. White is one of the few players to have played five collegiate seasons. He was granted a red shirt exception but did actually play in 5 different seasons for the University of Kansas. After his career at Kansas he was a member of the 1968 USA men’s national basketball team who took gold at the Mexico City Olympics. White joined a Boston Celtics team that was about as sure of thing to win a championship that there ever was in sports. The Celtics had won 11 NBA titles in 13 years, but before training camp Celtic legend Bill Russell retired. White was part of the Celtics first losing season in 19 years during his rookie year. During his second year the Celtics returned to glory making the post season once again. White made his first all-star team during that season and make seven consecutive all-star games from 71 until 77. In the 1974-75 season the Celtics returned to the NBA finals and defeated the Milwaukee Bucks. White had established himself as one of the teams stars along with John Havlicek and Dave Cowens. Two years late the Celtics made the finals again this time against the Phoenix Suns and this time it was White’s turn to shine. Game five of this series was a triple over-time thriller with several buzzer beaters earning the game the name the greatest game ever played. In game 5 White had 33 points and 9 assists in 60 minutes of game time as the Celtics won 128-126. The next night Boston won their second title in 3 seasons and their 13th in 20 seasons. White suffered an injury in the 77-78 season which would eventually cut his career short. He played in just 46 games that season and averaged only 14 points a game. He continued to decline and partway through the 78-79 season he was traded to the Golden State Warriors as the Celtics began to rebuild. White played a season and a half with the Warriors than 13 games with the Kansas City Royals before he retired from the NBA in 1981. 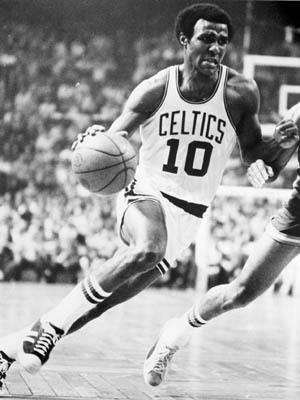 His #10 was retired by the Celtics in 1982 and he currently works as director of special events for the Boston Celtics. White has also done some limited acting since his NBA career ended, he appeared in the 1980 movie Inside Move and the 2007 movie The Game Plan which also starred his son Brain J. White.